Located in the heart of Atlanta, Piedmont Park is one of the city’s most beloved historic treasures. 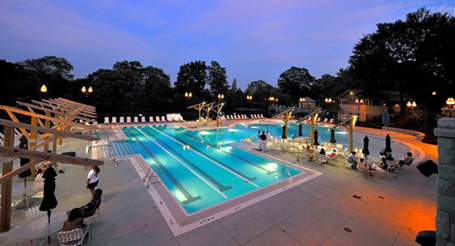 Swimming has been part of the culture at Piedmont Park since it’s creation in the early 1900’s. Swimming in the lake was replaced by a lakeside swimming pool in 1973. Both were supported by an adjacent “Bathhouse” building. As Phase 1 of their “Breaking New Ground” campaign, which expands the 100-acre park by 53 acres, the Piedmont Park Conservancy invested in the completion of renovations in the historic park. This phase included renovation of the 9,000 sq. ft. 1926 granite bathhouse building into the “Greystone” multi-use facility, and the replacement of the adjacent deteriorating 1973 swimming pool with the Piedmont Park Aquatic Center. The design of the new aquatic center, by Counsilman-Hunsaker and Smith Dalia Architects, included participation from the City of Atlanta, adjacent neighbors and friends of the park.